31 items comprising 105 pages, 90 manuscript and 15 typescript, all in Hebrew. Various sizes. Generally in good condition. This collection of Zionist essays, letters, and other papers documents a crucial period during the British Mandate in Palestine. The author, Aryeh (Simochony) Friedlansky, was a member of the Revisionist Zionist movement founded by Ze’ev Jabotinsky. These newly discovered documents shed valuable light in the history of Revisionist Zionism. “Revisionists produced a rich corpus of writings on a wide range of topics, in the process creating a radical new vision of the Hebrew national revival” (Kaplan, The Jewish Radical Right). At its core Revisionist Zionism was nationalist and thus was at odds with Labor Zionism, the mainstream political system dominating Jewish institutions at the time. These papers record Revisionist Zionism’s opposition to many of the political developments of the 1930s. Revisionist Zionism was a “comprehensive national philosophy that sought to refashion every aspect of Jewish national life in its image, a philosophy whose political and cultural imprint is still very much evident in modern-day Israel” (Kaplan). Subjects include: the formation and constitution of Friedlansky’s Youth Group Union in Jerusalem in 1930, the Betar youth movement, Herzl, Jabotinsky, “A Letter to the High Commissioner of the British Mandate of Palestine,” pro-Arab bias among the British, the rise of violence against Jews in Palestine, Arab riots, promotion of sports among Jewish youth, military service, conscription, and the promotion of a national spirit among Jews in Palestine. Many of the Revisionist documents in this collection demonstrate the movement’s campaign for militant action. 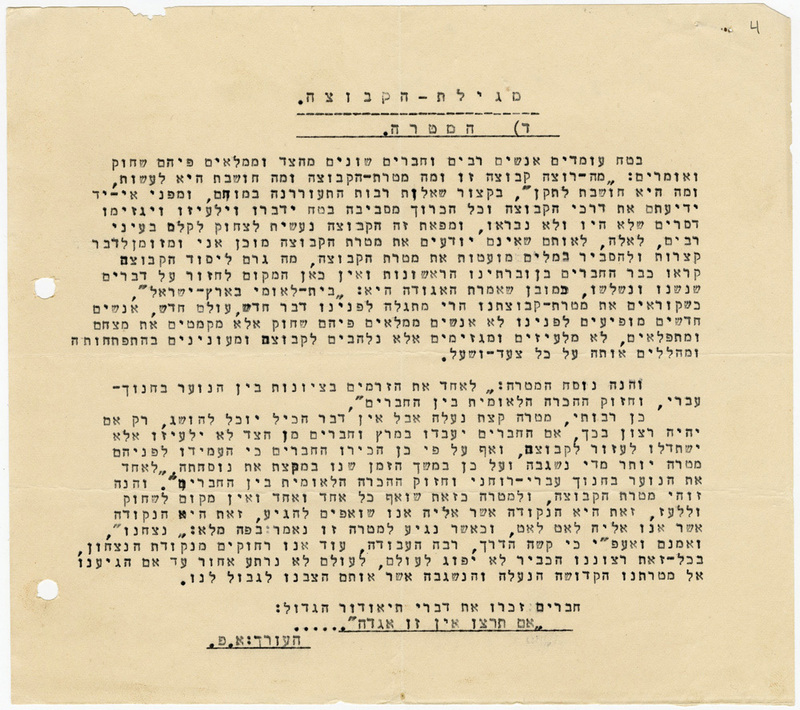 Several papers concern Jabotinsky’s Betar, a Revisionist Zionist youth movement intended to abolish the “ghetto” mentality of the Jewish people and to cultivate a new kind of Jew powerful enough to build the state of Israel. In “The Sportive and Cultural Work in Betar,” Friedlansky discusses how Jews must become strong and physically powerful in order to protect themselves. “The Question of Legion” and “Betar: A Movement of Liberation” oppose the stereotype of Jew as coward, arguing that a positive militaristic spirit must be instilled in Jewish youth. Unlike members of the Labor movement who saw themselves as workers tied to the land, “young Revisionists saw themselves as warriors, the leaders in the fight for independence” (Kaplan). This rare survival documents a major force in the development of the modern state of Israel. “The Revisionists embodied the dark side of the Zionist dream, and the violent and militaristic element that they represented has been ignored and overlooked by both the Zionist (and Israeli) academic and the political leadership …” (Kaplan). This unusual collection merits preservation and scholarly investigation. A detailed description and inventory is available on request.